The establishment owner must register to benefit from the services provided by the MOTA classification system. please note: to receive a password, you must enter a correct email address and mobile number. The establishment owner will receive a confirmation message on his/her email and SMS that the request has been sent. Your establishment registration request has been received. Once approved, the establishment owner will receive a confirmation email and SMS with his/her password. Your request for registration of the establishment has been approved by the Classification Team. Please upload your documents before [DD/MM/YYYY]. You may access the system using the following password [XXXXX]. A location approval process is a pre-condition to request an establishment new classification. 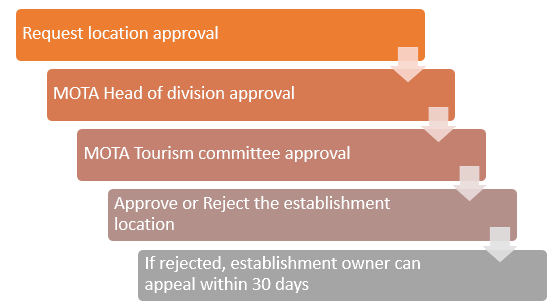 Once the registration is approved or rejected, the establishment owner will receive a confirmation email and SMS that the location has been approved or rejected by the Tourism Committee. Your request for location approval has been approved by the Tourism Committee. Your request for location approval has been rejected by the Tourism Committee, you can appeal within 30 days (Check appeal process). The establishment owner must obtain location approval to be able to request a new classification. 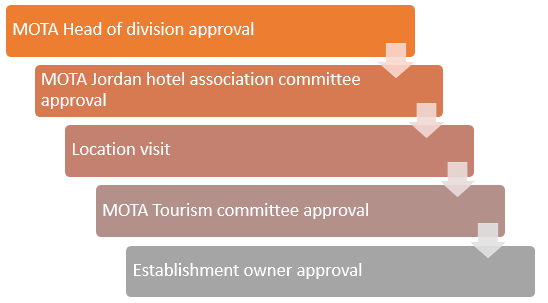 Once approved, the establishment owner will receive a confirmation email and SMS that the new classification has been approved or rejected by the Tourism Committee. Your new classification request has been approved by the Tourism Committee. Your request for new classification has been rejected by the Tourism Committee, you can appeal within 30 days (Check appeal process). If the establishment owner has made improvements to his/her establishment and feels that he/she needs a higher degree, he may request a higher grade for his/her establishment. 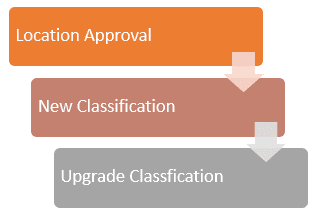 Once the upgrade classification is approved, the establishment owner will receive a confirmation email and SMS that the upgrade classification has been approved or rejected by the Tourism Committee. Your request for an upgrade classification has been approved by the Tourism Committee. Your request for an upgrade classification has been rejected by the Tourism Committee, you can appeal within 30 days (Check appeal process). If the establishment owner requests a new classification and hasn’t received a response yet, he/ she may apply for a Soft Opening of the establishment until the new classification procedure is complete. The purpose is to test services among a small audience and adjust as necessary before providing services to all. The establishment owner will receive a confirmation email and SMS that the soft opening has been approved or rejected by the Tourism Committee. Your soft opening request has been approved by the Tourism Committee. Your request for soft opening approval has been rejected by the Tourism Committee, you can appeal within 30 days (Check appeal process). 2. The establishment owner will be requested to submit his self-assessment as part of the new classification/upgrade classification processes. After logging into the site and request a New Classification process or Upgrade process, the request will appear on your Task List page. In every classification procedure, the establishment owner can appeal the decisions of the Ministry up to 30 days after the decision. If the establishment owner decides to appeal, a re-visit to the establishment will occur and the establishment will be re-evaluated.